Those of you lucky enough to already own a 3D printer might be interested in a new piece of hardware which has been specifically designed for the 3D printer industry and easily adds wireless 3D printing control to already existing 3D printer. Allowing you to enjoy the ability to control your 3D printer directly from your smart phone using a companion application. Watch the video below to learn more about the Borlee 3D Printing Box which supports a wide range of different 3D printers. The developers of the Borlee Box and its companion wireless 3D printing smartphone application, explain a little more about the hardware’s design and functionality. As well as everything you can accomplish directly from your smartphone wirelessly. At Borlee we’re always looking for ways to make 3D printing easier and more convenient. We want 3D printing to be something available to everyone and not just the select few designers and engineers. This has always been our core mission. So we challenged ourselves to solve this difficult problem. Today we are here with an affirmative answer, and we’re excited to introduce to you our latest innovation- The Borlee 3D Box- an entirely new solution to dramatically improve the use of 3d printers. 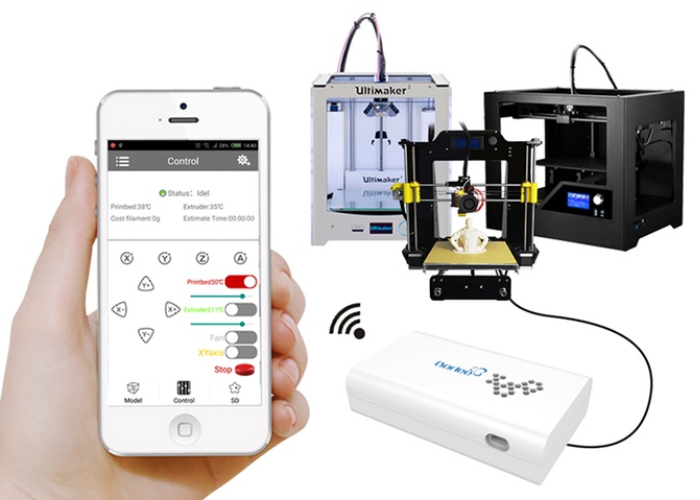 Easy 3D printing set at the press of a button, all on the comfort of your smart phone. Click the “ok” button on the app, and the 3d box will control the printer automatically slicing, heating and printing the model is selected. Also you can adjust the printing size of any of the models. GET FULL CONTROL: Get real time to control movement of X, Y, Z axis, the hot bed, heating of the extruder and material out from extruder. Real time to monitor temperature of printer and hot bed. Check the printer if in printing, or in slicing etc. any state. When it is printing any online model, it will be show how long the printing time is and how much weight of material is needed. After the printing is finished, it will send you a tip to remind you. For more information on the new wireless 3d printing box and application jump over to the Kickstarter website for details by following the link below.